John Fricke gesticulates, Elliott Tiber smiles. Hat, Tiber noted, was a gift from Tennessee Williams. Photo by Martha Wade Steketee. On August 11 at a screening of television appearances ranging from Jack Paar show visits from 1964 and 1967 to a 1968 visit to the Philadelphia-based Mike Douglas show to show #20 of The Judy Garland Show, recorded in early 1964, Elliot Tiber attended as an audience member and was gracious enough to take some questions from John Fricke (the in-person and informal host of the summer’s events) and from the audience. Mr. Tiber wrote the book made into the Ang Lee film Taking Woodstock about his 34-year-old self working at the family hotel and the essential role he played in setting up the Woodstock music festival in 1969. And this year Mr. Tiber has published a “prequel” memoir that covers the years before Woodstock. In a general dreamy style that is less based on dates and more on emotional decisions and the dramatic arc of a life, we learn of hard-working store-owning Brooklyn parents, a kid with a talent for art, a dreamer who jumps into Manhattan life and comes out as a gay man in his 20s, builds a career in decorating, and meets Judy Garland. Palm Trees on the Hudson at left. 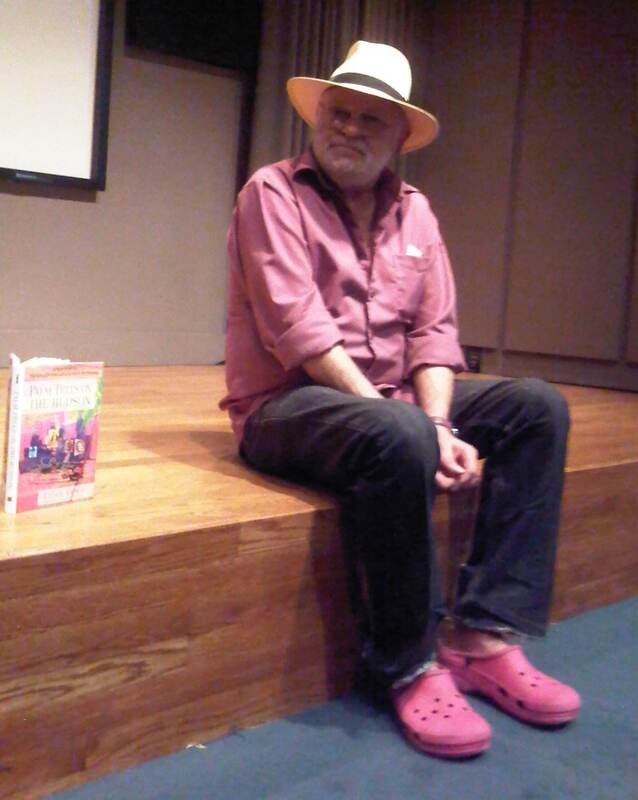 Charming Elliot Tiber, be-hatted and be-Croc-ed, at right. Photo by Martha Wade Steketee. Little presents all around. Thank you, Mr. Tiber. I recently saw the movie “Taking Woodstock” and loved it….especially the Judy reference; wasn’t too sure what that was all about but now I know! And, because of your post here, I am definitely going to get a hold of his book “Palm Trees on the Hudson” !!! Thank you! !